I am asking if you would like to rollerblade together tomorrow. I am asking if you would like to rollerblade together tomorrow? I am asking “if you would like to rollerblade together tomorrow”? Yes, Jean, you were right, about that answer. Yes, Jean, you were right about that answer. Yes Jean you were right about that answer. Yes Jean, you were right about that answer. Wherever we go, People recognize us. Wherever we go people recognize us. Wherever we go; people recognize us. Whenever Cheryl, is in town, she visits her sister. Whenever Cheryl is in town. She visits her sister. Whenever, Cheryl is in town, she visits her sister. Whenever Cheryl is in town, she visits her sister. My favorite musician, who is also my cousin plays a mean fuzz bass. My favorite musician, who is also my cousin, plays a mean fuzz bass. My favorite musician who is also my cousin plays a mean fuzz bass. My favorite musician who is also my cousin, plays a mean fuzz bass. It may not be the correct part but, I bet that it works. It may not be the correct part but: I bet that it works. It may not be the correct part but, I bet, that it works. It may not be the correct part, but I bet that it works. You are, my friend, however. I cannot afford to lend you any more money. You are my friend; however; I cannot afford to lend you any more money. You are my friend, however I cannot afford; to lend you any more money. Paul Simon sang I am a rock, I am an island. Paul Simon sang I am a rock; I am an island. I asked Ella, “Did he ask for his ring back”? I asked Ella did he ask for his ring back. John F. Kennedy Jr., became a magazine publisher and a pilot, before his tragic death. John F. Kennedy Jr. became a magazine publisher and a pilot before his tragic death. John F. Kennedy Jr. became a magazine publisher, and a pilot before his tragic death. John F. Kennedy Jr. became a magazine, publisher, and a pilot before his tragic death. Julio my friend from Ames Ohio will join us. Julio, my friend, from Ames, Ohio will join us. Julio, my friend from Ames, Ohio will join us. Julio, my friend from Ames, Ohio, will join us. The elections will be held on the first Tuesday, of November 2018. The elections will be held on the first Tuesday of November 2018. The elections will be held, on the first Tuesday of November 2018. The elections will be held on the first Tuesday of November, 2018. The elections will be held on Tuesday, November 6, 2018, and the polls will be kept open until 8:00 p.m. The elections will be held on Tuesday November 6, 2018, and the polls will be kept open until 8:00 p.m. The elections will be held on: Tuesday, November 6, 2018, and the polls will be kept open until 8:00 p.m. The elections will be held on Tuesday, November 6, 2018 and the polls will be kept open until 8:00 p.m. It is good that a caring, dedicated teacher like Mr. Fuentes should be appreciated by students who are usually, bored and too busy. It is good that a caring dedicated teacher like Mr. Fuentes should be appreciated by students who are usually bored and too busy. It is good that a caring, dedicated teacher like Mr. Fuentes should be appreciated by students who are usually bored and too busy. It is good that a caring dedicated teacher like Mr. Fuentes, should be appreciated by students who are usually bored and too busy. Knowing her own strengths and working hard made her a success in school. Knowing her own strengths and working hard made her, a success, in school. Knowing her own strengths and working hard, made her a success in school. Knowing her own strengths and working, hard, made her a success in school. I need to locate four states on the map. Minnesota; Michigan; California; and Nevada. I need to locate four states on the map; Minnesota, Michigan, California, and Nevada. I need to locate four states on the map: Minnesota, Michigan, California, and Nevada. I need to locate four states on the map Minnesota, Michigan, California, and Nevada. Right now I want two things: peace and quiet. Right now I want two things; peace and quiet. Right now I want two things … peace and quiet. Right now I want two things peace and quiet. Our philosophy teacher thinks that Einstein believed that we cannot stop war by waging war. Our philosophy teacher thinks that Einstein believed, that we cannot stop war by waging war. Our philosophy teacher thinks that Einstein believed that, we cannot stop war by waging war. Our philosophy teacher thinks that Einstein believed: that we cannot stop war by waging war. A well—made argument was presented for negotiating a peaceful resolution. A well-made-argument was presented for negotiating a peaceful resolution. A well made argument was presented, for negotiating a peaceful resolution. A well-made argument was presented for negotiating a peaceful resolution. You are a Punctuation and Capitalization Master! Congrats. 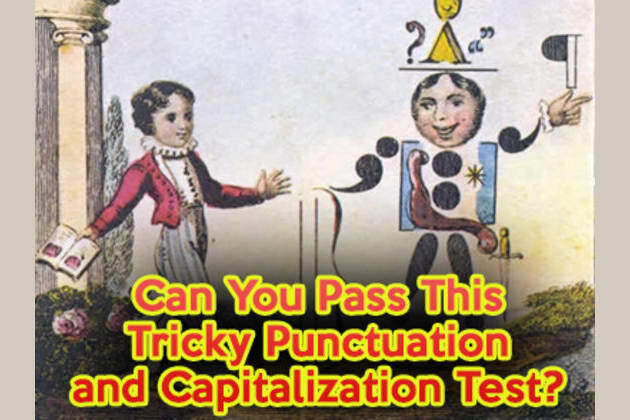 You absolutely aced this punctuation and capitalization quiz! You're in the top 1% ranking because you got 100% correct. You are a Punctuation and Capitalization Expert! Congrats. You nailed this punctuation and capitalization quiz. You're in the top 98th percentile. You are a Punctuation and Capitalization Champ! Congrats. You nailed this punctuation and capitalization quiz. You're in the top 95th percentile. You got over 50% correct but you didn't quite try your best. The questions aren't that hard if you take a look at all the options available. You can do really well. Go back one more time and try your best! Only 1 in 50 people can pass this punctuation and capitalization test - can you beat the odds and be that 1? Take this 20-question quiz and test your skills!